Whether you’re looking for simple lunch recipes, vegetarian lunch, or a light supper, these fajita wraps fit the bill. They’re perfect for when you want to quickly throw something together that’s light yet filling, healthy yet delicious. I make variations on this easy lunch recipe often, sometimes adding chicken or tofu, throwing in some avocado or salsa, or even topping it with cheese and making it a quesadilla. Fresh lime, chopped cilantro, chili peppers and tomatoes would all be great additions as well. The charred sweet peppers and onions work perfectly with the rich, almost creamy black beans and a dollop of sour cream or Greek yogurt brings the whole thing together. Black beans are high in fiber and protein, so they’ll fill you up and keep you full. Plus they’re a natural energy booster, so are a superfood at lunchtime. This simple method for cooking the black beans yields perfect results every time, so give it a try the next time you’re making them. They make for some pretty mean rice and beans. These pepper, onion and black bean fajita wraps make the perfect healthy, vegetarian lunch that the whole family will love. Cut the onion in half. Cut one half into slices and finely chop the other half. Heat the oil in a skillet over high heat. Add the sliced onion and pepper and cooking, stirring occasionally, until slightly charred. Transfer to a plate and set aside. Return the pan to the stove and lower the heat to medium. Add the chopped onions and cook for 1 minute. Add the beans with liquid and simmer until the liquid is mostly absorbed. Season with salt and chile powder, if using. Mash the beans slightly with a spoon. Remove from the heat. Divide the black beans between the two tortillas, spooning them down the center. Top with peppers and onions and a dollop of sour cream. Roll up and enjoy! Parve and Vegan if you leave out the sour cream or use a non-dairy alternative. This is perfect. Such a fun idea! Black beans have such great flavor! And the yellow pepper, in particular, contrasts so nicely with their color. Really colorful dish. The chipotle powder wouldn’t be optional for me! Love the steam in the “action” shot of the beans! These look delicious! After living in Brazil for almost six years, black beans make a regular appearance on our family meal rotation. I am not sure I can talk the troops in to fajitas on the first night, but I am certainly going to make them with leftovers! Great idea! Oh gosh this looks so great. I love fajitas and have been trying to eat less meat lately- looks delicious. Hooray for fajitas! I haven’t made a big mess of peppers and black beans in far too long. Thanks for the heads up! A perfect lunch or dinner! 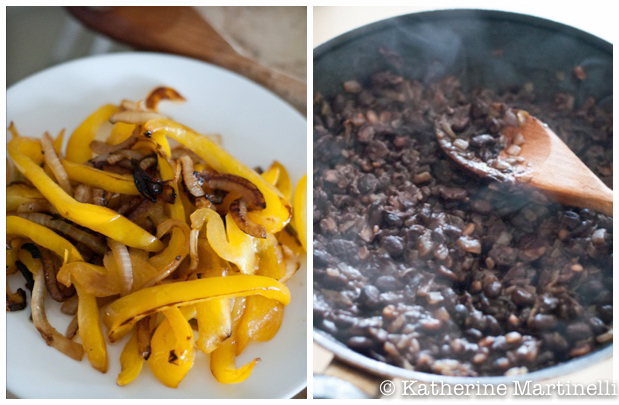 I love making fajitas with black beans. Of course we’ll use green or red chile sauce. 🙂 Great fajitas! Perfect lunch., I love fajitas veg. Or not they are always delicious. So simple and so lovely. This would be a perfect lunch or simple dinner! I love simple dishes like these. So easy to prepare and so filling to the yummy. Wonderful post as always. Yummo! 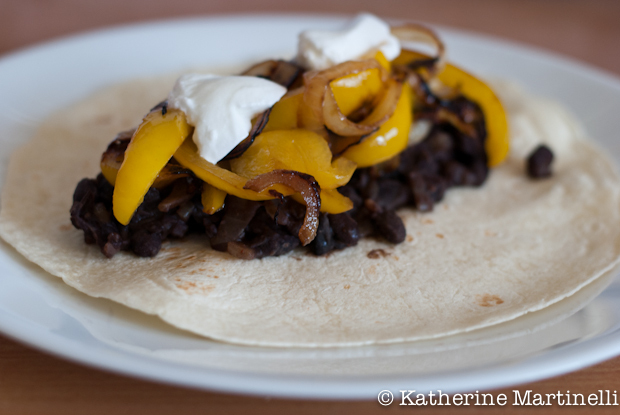 I love black beans and always have fresh and canned ones for whenever the mood strikes me. I am trying to have a couple of meat free days each week so this recipe is definitely going on the list.